I wrote the villanelle "Because Her Heart is Tender" for my wife Beth on the first anniversary of 9-11, after I found her weeping as the names of the fallen were recounted during a memorial service. The wonderfully moving 9-11 remembrance song "Liturgy for the Drowned" is by Lonnie Glass and Norman Ball. 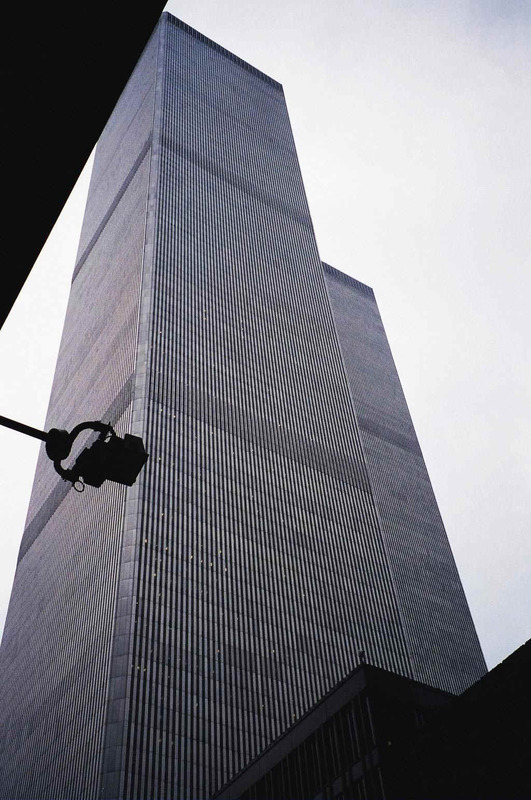 And please be sure to read the poems by T. Merrill, who also contributed the photographs on this page, along with an account of how he came to take them just a few days before the Twin Towers fell. it called the sun to wake her). and listens to her heart’s emphatic song. Lain down with the dead. Mankind must put an end to war, or war will put an end to mankind.—John F. Kennedy, Jr.
the terrible things some mortals do. to be at work tonight. But of course Christina Taylor-Green did not survive to see her tenth birthday. What can we do when innocent children die so senselessly? We must do all we can to prevent the next senseless murder. This means that adults need to end the wild proliferation of weapons; politicians spewing lies, hatred and intolerance; and people acting as if believing the Bible and Constitution gives them the right to abandon reason and go on the warpath. If we want all children to live in a safer world, we must put an end to the bigotry, intolerance and bullying we see everywhere around us. the white man's notion that he is less savage than the other savages. Yet they call me a thief. What white man has ever seen me drunk? Who has ever come to me hungry and left me unfed? Who has seen me beat my wives or abuse my children? What white woman, however lonely, was ever held captive or insulted by me? Yet they call me a bad Indian. but seldom to express my happiness. were alike uncommon to me while in the jaws of slavery. the songs of the one and of the other are prompted by the same emotion. But pray that peace can still be humanity’s finest hour. While American politicians and the American public insist that the United States is the greatest nation on earth, if we examine the past and the present honestly, it becomes apparent that white supremacists who claim to be "Christians" have inflicted incredible suffering on millions of Native Americans, African Americans and Muslims. How many of them ever did anything to hurt white Christians, until their loved ones, culture and way of life were under attack? So if Americans claim to be the only victims, it is obviously a false claim. If we want peace, justice and security for our own children, we cannot blindly ignore the fact that our government's policies and actions constantly endanger them, by constantly endangering the lives and happiness of other men's children. This declared indifference, but, as I must think, covert, real zeal, for the spread of slavery, I cannot but hate. I hate it because of the monstrous injustice of slavery itself. I hate it because it deprives our republican example of its just influence in the world, enables the enemies of free institutions with plausibility to taunt us as hypocrites, causes the real friends of freedom to doubt our sincerity, and especially because it forces so many good men among ourselves into an open war with the very fundamental principles of civil liberty, criticizing the Declaration of Independence, and insisting that there is no right principle of action but self-interest. We must recognize that when our government acts out of self-interest today, ignoring the most fundamental principles of justice and the rights of millions of completely innocent women and children, we are bound sooner or later to find ourselves in an open war with the men who love them, and want to protect them. We may not agree with their tactics, but they do not agree with ours, and in their minds are fighting fire with fire. At the same time, our friends abroad doubt the sincerity of our ideals and our enemies taunt us as hypocrites, and use our hypocrisy to raise funds and enroll recruits to attack us. (3) Yes, we should defend American children, but in order to truly protect our children, we need to consider how the cannon balls "may be forever banned," so that they can live in peace without the ever-present threat of war. To this day, the US government, American politicians and the American public have never openly and honestly discussed the root cause of 9-11: the Nakba, which has left millions of Palestinians bereft of freedom, representative government and basic human rights. If our government interferes with the ability of other men's loved ones to enjoy the rights and freedoms we cherish, then obviously we as a nation are not blameless in their eyes. If we are blameless in our own, is it because we are willfully blind, or ignorant of the facts? How many Americans really know and understand what our government has been doing in the Middle East for more than half a century? What our government seems to fail to understand is that mothers and fathers care more about their children than they do American "ideals." If in its relentless pursuit of "liberty" and "democracy" for Americans and their favored friends, millions of less-favored children begin to suffer and die, the men who have to watch them suffer and die will see this the way American men saw 9-11. Unfortunately for Americans, the honest truth is that the terrorism of Jews and Christians against Palestinians happened long before 9-11. Few Americans are willing to see this, much less admit it and deal with it. But if it is wrong for American children to suffer and die unjustly, then it is obviously wrong from the richest, most powerful nation on earth to cause so much suffering and so many deaths among poor, disadvantaged children. The solution is not for American men to keep killing Muslim men, but for Americans to respect the basic human rights of Muslim women and children, because this is the only moral solution and the only path to peace. To paraphrase Dr. Martin Luther King Jr., the governments of Israel and the US sowed the wind, and on 9-11 the American public reaped the whirlwind. If we want to end acts of terrorism against the US, we will have to end the terroristic and anti-democratic policies and actions of our government in the Middle East. If we don't, the cannon balls will continue to fly and children on both sides will continue to die. The US State Department and the Pentagon are fully aware of the real cause of 9-11 and the current wars. General David Petraeus speaking before the Senate Armed Services Committee said, “The conflict foments anti-American sentiment due to a perception of US favoritism for Israel. Arab anger over the Palestinian question limits the strength and depth of US partnerships with governments and peoples in [CENTCOM’s area of operations] and weakens the legitimacy of moderate regimes in the Arab World.” The New York Times reported that in an interview Petraeus stated, "If you don't achieve progress in a just and lasting Mideast peace, the extremists are given a stick to beat us with." As reported by Bloomberg's Jeffrey Goldberg, US Secretary of Defense Roberts Gates recently said that Israel has done nothing to help the US in its quest for peace, despite all the US has done to help Israel in the form of advanced weapons, intelligence sharing and missile defense technology (not to mention billions of dollars in financial aid). How is it "wrong" for Americans to ask Israeli Jews to do what Americans did themselves, when they abandoned Jim Crow laws and kangaroo courts, and did the right thing by treating people of all races and creeds as equals? Finding the path to peace may not be easy, but it is essential. Just because an answer isn’t easy doesn’t mean that it shouldn’t be relentlessly pursued. For the first time in history, most of the civilized world has stable borders. Just sixty years ago, "civilized" nations like Germany, Japan and Italy began blowing up cities by the scores and killing human beings by the millions. It has been estimated that 70 million people died as a result of World War II. Since then, we have made tremendous progress in just a few decades. And in less than 150 years, the US has managed to abolish slavery, radically advance women’s rights, and create a melting pot in which all races and faiths can live together in peace and equality. Today we're making substantial progress on gay rights as well. So we shouldn’t assume that global peace is impossible, because not so very long ago those other things seemed "impossible" too. Perhaps for Americans peace begins with a strong defense and an even stronger value for human life, equality and justice. As we mourn our fallen dead, let’s also mourn for the children of Iraq and Afghanistan who died through no fault of their own, and hope that all the children still living will learn to live in peace, rather than one day hurling atomic bombs at each other. As Albert Einstein said, if we fight World War III with weapons of mass destruction, the next war will be fought with sticks and stones. As John F. Kennedy said, if we don't end war, war will end us. recording last days, lost sights. In wounds pledged once to hope -- cleft to despair? Of cruel trials you undergo. Leisurely finning toward its mark. For spirit's peace beyond despair. and as it quarrels, hungers for you still. almost not noticing his dumpster condo next to the junior high school's sports field. on the page he's reading. fell to the "barbarians at the gate." of Summer School's repeat failure. dropout cramming there for finals. Two weeks before 9/11, 200l, at the end of August that all too memorable summer, I was proudly showing off Manhattan, my birthplace, to a French friend who had come to the US to spend some time with me and see some sights. We had driven down from Boston, where I now live most of the time, planning to spend about a week in the city. One day during our visit—I believe it was August 29th, but I could be off a day either way—I took him to have a look at the WTC. It had turned into a foggy, drizzly day, a good time to be indoors, so we decided to enter the center and see what we could see from the top of the south twin. 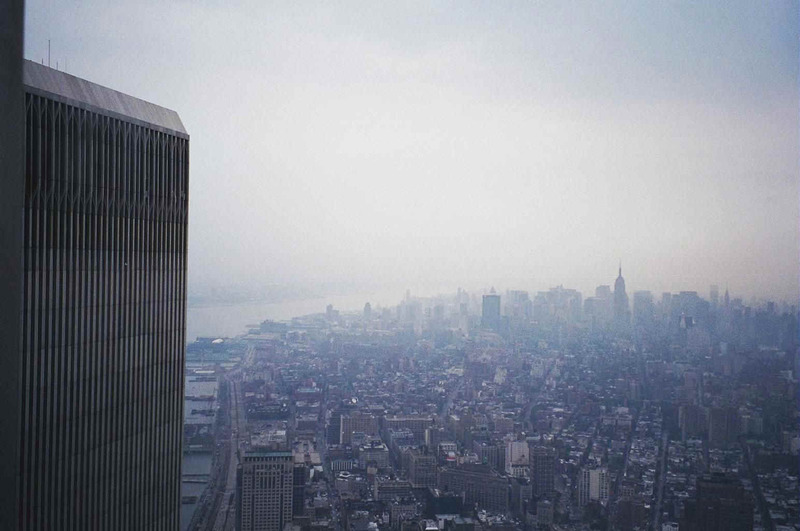 Due to the weather, the open air rooftop promenade, which was located above the tower’s top floor, the 110th, wasn’t open, so we took in the sights from the observation deck on floor 107. I had brought my camera with me, and, moving from wet window to wet window, spent maybe half an hour snapping pictures of the city as it stretched out in various spectacular ways from the four sides of our since-demolished outlook. At the time I had no idea, of course, that the pictures I was shooting might ever mean more to anyone than the usual holiday mementos. The horrific vision of the explosions, and then the collapse of those two soaring behemoths, in which so many were trapped in an avalanche of destruction, has branded itself into the memories of millions. 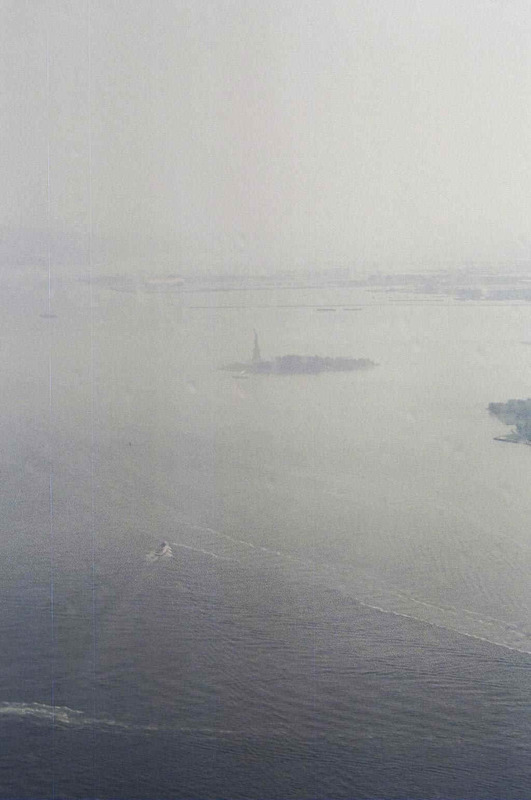 The first section of this book [in which the poems appeared], especially, "Lost Island Views," is intended as a commemoration of that tragic watershed moment in our history. 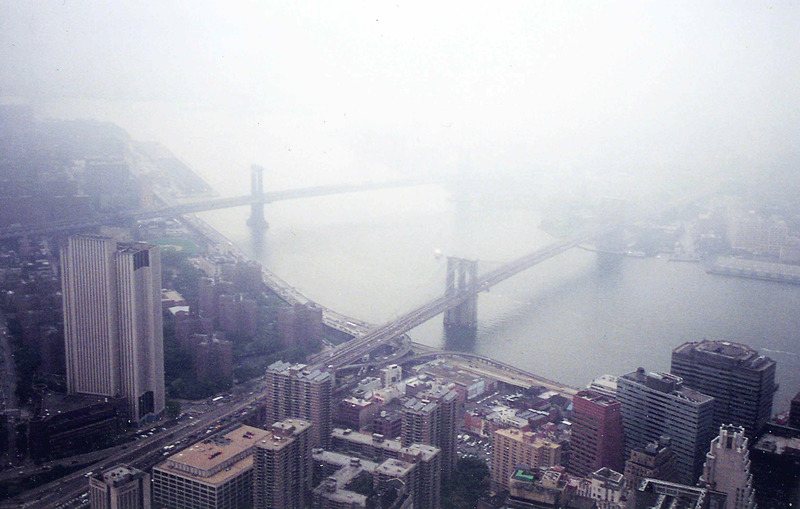 Since the city lay under a blanket of fog at the time all but one of the pictures in this chapter were taken, and the tower’s windows were blurry, the overall mood of these views seems somber, the accident of weather having imbued them with an atmosphere that seems peculiarly fitting to the theme of loss and grief. The Manhattan series segues into a series of scenes captured further north, in Quebec. The picture entitled “Spotlight,” which leads off this second group, was placed at the chapter's beginning because it seemed a kind of visual metaphor of 9/11, and in fact brought back to my mind the TV coverage, incredulously witnessed by so many, of the buildings burning. It was that photo, also, that inspired my poem “There But For The Grace,” which also appears in this chapter, and which expresses my feeling of personal connection with the tragedy.